We review Mayfair Games Settlers of America. This Catan Histories game takes players from the early settlements of America through its Westward expansion. Back in April we reviewed The Settlers of Catan here on BGQ, and if you didn’t get a chance to read it well, spoiler alert, we love it. Catan has also been heralded as one of the better “gateway games” in board gaming. Since it was first published back in 1995, there have been a number of spinoff games in the Catan universe. One of the latest additions is part of their Catan Histories line (Struggle for Rome, The Settlers of the Stone Age). 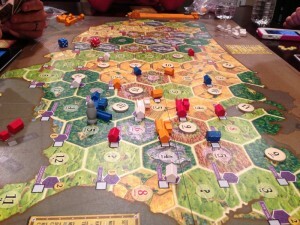 Settlers of America – Trails to Rails is the latest Catan offshoot to grace our tabletop. Is this new Catan game worthy of it’s Settlers name? Read on to find out! Settlers of America – Trails to Rails is a resource management and trading game for 3-4 players. 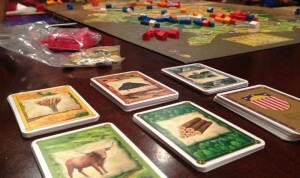 Catan America (as we call it) takes about 2 hours to play and plays best with 4 players. The game sets up with players starting in the east and Midwest. Eventually they will expand to the west. 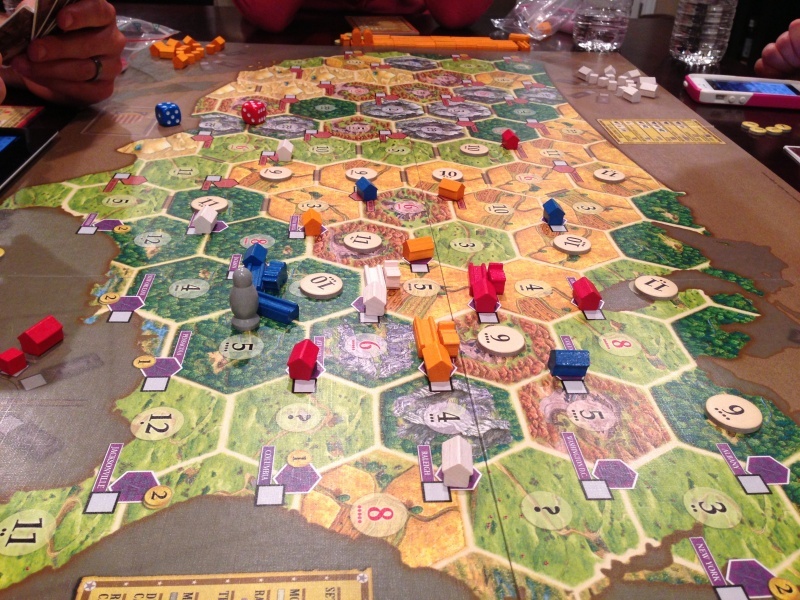 If you are not familiar with the Catan family of games, I’d suggest you start by reading our full review of The Settlers of Catan. This game forms a basis for all the Catan family of games and is an excellent game in its own right. With that in mind, there are a few changes between The Settlers of Catan and Settlers of America. 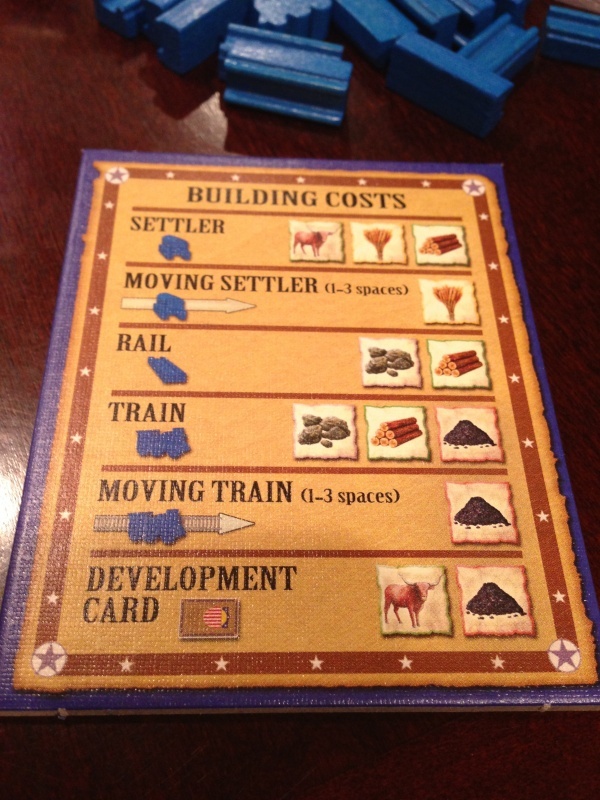 In Settlers of America, players will be building settlers, trains, rail roads and cities. Each player must spend their time between moving their settlers, founding new cities, moving their trains and delivering goods to other cities. The goal in Catan America is to be the first to deliver all ten of your goods to different cities. Gone are the familiar victory points and the bonus for largest army’s and longest road. Also new is a fixed game board in the shape of the United States. Other than that, the game plays fairly similar to The Settlers of Catan. Players will roll for resources every turn, the robber will still be around to harass you and trading between players will still happen. The resource cards in Settlers of America are similar to most Catan games. 5 different types and a stack of development cards. Anyone who owns a Catan game will see a lot familiar parts in Settlers of America. There are a number of wooden pieces (cubes, rails, trains, settlers, settlements) in 4 different colors like you might expect. Also included is the standard pile of cards to serve as resources and development cards. The main difference is the game board. Gone are the variable hexes that can be configured endlessly. Replacing that is a large game board with a map of the United States divided up into Catanesque hexes. This means that the board will be roughly the same for every game of Catan America you play. The only difference will be where some of the numbers are placed. Overall players should feel comfortable with what they get in the game box. If you were pleased with the components of your previous Catan games then you will have nothing to complain about here. Each player has a wheel the shows what goods are available to be delivered and how many cities they have left to found. Everyone starts the game with 2 cities and a railroad track. On the game board, each player also gets a “wheel” to house their remaining cities and goods. 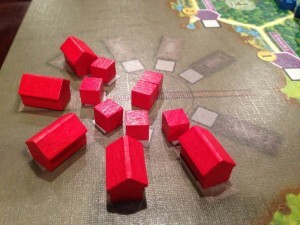 As a player builds a city on the board, the goods cube will move to the center of the wheel, marking it ready to be delivered. It’s a nice mechanic that forces players to balance expansion with delivery. It also works well to remind players if they have a good cube available to be delivered, since you can deliver one until you build a city to free it up. But I’m getting ahead of myself. Turn order in Settlers of America is pretty similar to your standard Catan game. At the start of every turn a player rolls 2 dice. The number that comes up indicates which hexes produce a resource. I should note that this part takes a bit longer as players have many more cities on the board (up to 10). If a 7 is rolled the robber will still come out vex a player. New here is the gold rule. If a player doesn’t get a resource on a turn, they collect 1 gold piece from the bank. On a players turn, they can trade 2 gold to the bank for any 1 resource. I was a fan of this new rule as it’s a good way to help mitigate the luck of the dice rolls. Settler: Players have 2 settlers they can build. They will move around the board (spending a wheat resources for every 3 spaces) and if they stop on an open city space, they automatically found a city there. The city token replaces the settler on the board who must be built anew to be used again. As noted earlier, building a city will free up a good cube to be delivered with your train. 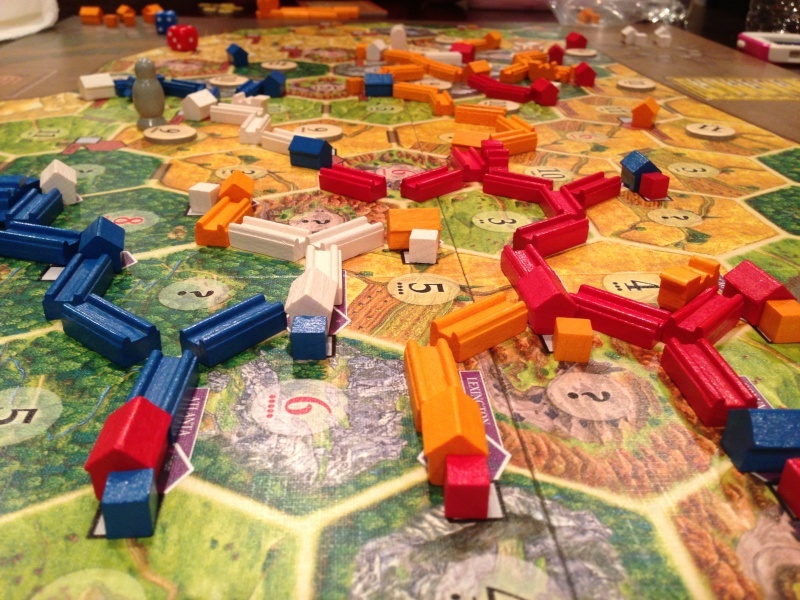 Railroad track: Players will build these to connect cities, much like the roads were used in The Settlers of Catan. The difference here is that any railroad can connect to any players city or rail. Also, any players train can run on your railroad (for a fee). Delivering cubes is only done with your train so building a rail network is a must. Trains: These run will run on the railroad track you build (obviously) and are used to deliver goods cubes. It costs 1 coal resource to move up to 3 rail spaces. If a train ends in an opponents city with an open cube space, they may deliver a good if they have one available. Development Cards: These are pretty similar to what’s in The Settlers of Catan, however there are no victory point cards in Catan America. After a player has finished building then an extraordinary build phase happens. 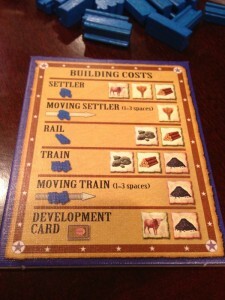 This lets all the other players build (but not trade or move trains/settlers) before the next player goes. 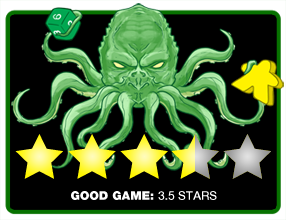 This is to allow players to spend resources before their turn to offset the threat of being robbed if a 7 is rolled. I’m guessing the designers thought this was necessary because of the higher amount of resources a player will be collecting each turn. Then the dice pass and the next player starts their turn. Rounds progress in this fashion until someone delivers there last cube (10th) and wins the game. 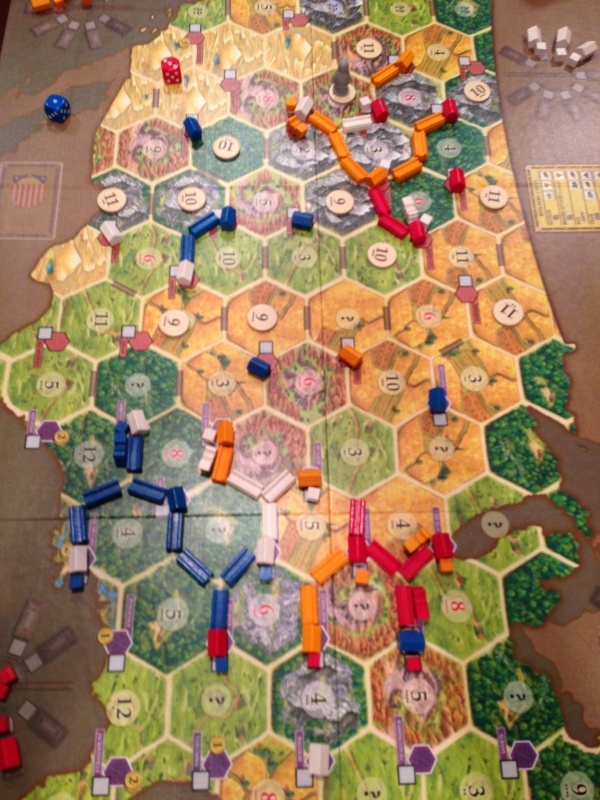 As the game progresses, players not only expand Westward, but they build out a large rail network to run their trains on. Mayfair Games did a fantastic job with the theme of Settlers of America. I like the map of the United States and how the game starts with all the players in the East Coast area. As the game progresses, players will migrate west before eventually being stopped by the Pacific. Mountains, plains and major cities are all about where you’d expect them. So top points to Mayfair for making the game feel very thematic. Players now have 6 different things to spend their resources on during the game. If you have played The Settlers of Catan then it won’t take long for you to pick up the rules for Catan America. The turn structure should feel very similar with some notable differences. Once thing I noticed is that trading happens a lot less in this game. This is probably both because of the amount of cities you have and the gold resource. Players will just have a lot more incoming coming in and the gold wildcard will provide even more options. Trading still happened in our games, it was just noticeably less. So if trading was your favorite part of The Settlers of Catan, then you might feel a little disappointed with Settlers of America. However, I think the strategy in Settlers of America runs a lot deeper than other Catan games. Players have to walk a fine line when making the decisions on how they are going to spend their resources. They have to build new cities to keep their income consistent, however if they spend too much time focusing on founding cities then all the convenient cube delivery spots will be taken. Conversely, if they spend their time building a rail network and delivering goods then all the good city spots will get taken and their income will suffer. So what you have is a balancing act that every player must be aware of. This creates some hard decisions on how a player will spend their resources on their turn. I think that’s probably my favorite part about Settlers of America. The path to victory is not always clear. That’s not to say the game isn’t without it’s flaws. With a play time of at least 2 hours, this is going to run a lot longer than your standard Catan game. Personally, I think the game could do without the extraordinary build phase. With up to 10 cities, players get enough resources that they can easily recover from a 7 being rolled and losing half. I think a player will have about 2-3 turns in a game where they don’t get a resource. Getting rid of that extra phase could probably cut 20-30 minutes off the game’s play time. Some people might also be turned off by the new win condition. The victory point mechanic feels very at home in Catan and, to be honest, it’s a little weird to have the game be a race to the finish. It takes some getting used to but I think it actually works well for the game. In all of our games, I think each player only ever had 1 or 2 cubes left when the winner delivered their last cube. This makes the game feel very balanced with everyone in it until the end. I know there have been some games of The Settlers of Catan I’ve played where a really bad starting spot has crippled a player and made for a less then enjoyable game. By late in the game, players will have founded cities on the West coast, and the rail network will be stretching across the board. Since you can only ever deliver goods to other player’s cities, this creates a good amount of interaction in the game. You need players to build their cities so you can offload your cubes. However you don’t want them to take the good resource hexes. Plus when they do build their city, that means they have a new cube free to be delivered, putting them closer to winning. I love this give and take dynamic between all the players. It also helps ensure that all players stay in a tight race with each other. You can’t advance one position without an opponent also advancing somewhere else. The other thing I find interesting is just watching the game expand. The game starts off with only eastern cites in play. But as the game progresses, players will slowly expand west and a rail network will slowly be deployed. It’s a nice organic progressions that’s just fun to watch as it unfolds. I think it also helps that I’m from the USA, so it feels like I’m watching a bit of my countries history. Once again, a fantastic job of tying the theme to the game. So the big question to ask is if Settlers of America is as much fun as The Settlers of Catan. I’d say yes, it’s fun, but I still like The Settlers of Catan better. The longer playing time and the expanded rules make the game not as accessible as The Settler of Catan. It takes a bigger commitment and there is a lot more going on. So, in my opinion, the champ hasn’t been overthrown by it’s younger brother. Hail to the king baby. If you’ve never played a Catan game before then absolutely start with The Settlers of Catan. You can’t go wrong there. But if you are like me, a seasoned Catan veteran, then Settler of America is a nice break from the standard Catan. I think I will still play The Settlers of Catan more, but when I’m looking for something a little different or a little heavier, I’ll probably reach for Settlers of America: Trails to Rails. 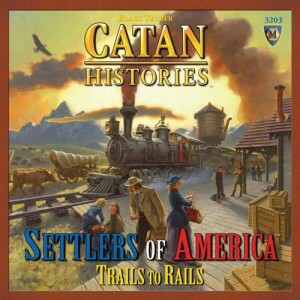 If you are already a fan of the Catan games and you are looking to add something new to your options, then absolutely pick up a copy of Settlers of America: Trails to Rails. The game will feel right at home and will be a welcome change to the standard Catan game, when you are the mood for it. Just watch out for the robber. Final Score: 4 Stars – A welcome diversion for players who love Catan, but it won’t replace The Settlers of Catan as your main Catan staple.